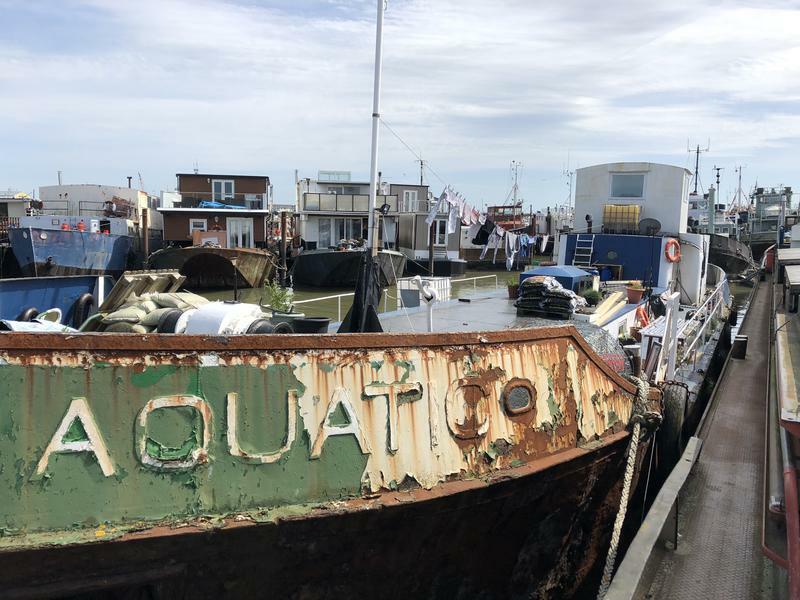 Premier Houseboats are pleased to present Aquatic, which has been converted to create a large family home with character and space, including the potential for a self contained flat on the upper level. The price of Aquatic has been drastically reduced as an alternative mooring will need to be found for her. Aquatic has been thoughtfully converted thus far, with plenty of potential to put your own mark on her, and finish the process. Entering through the original wheelhouse, stairs lead down to the main living area. This area houses three large double bedrooms, and an office, which could be a fourth bedroom if required. There is a large family bathroom with bath, toilet, hand basin and separate shower cubicle. There is a lounge, and a large kitchen diner. The kitchen has lots of work surface and storage, a diesel fired range, stand alone gas oven and a fridge freezer. Throughout this area there is amazing headroom, good light, and characterful touches throughout, which creates amazing space without losing the feel of a boat. The boat has diesel fired central heating throughout. The wheelhouse has been extended so that there are two single bedrooms and a bathroom with shower, toilet and hand basin. There is room to create another kitchen, and a small set of stairs that leads up to a lounge area. This whole area can be self contained, or become part of the main living area. Vessel Name: Aquatic Vessel Condition: Good Year Constructed: 1964 Year Reffited: 2012 Berths: 8 Cabins: 5 Heads: 2 Length Over All: 113' Beam: 25' Maximum Draft: 5' Hull Type: Flat Hull Material: Steel Disclaimer: Premier Houseboats offers the details of this advert in good faith as it was presented by the seller or his representative but cannot guarantee or warrant the accuracy of this information nor warrant the condition of the described item within this advert. A buyer should instruct his agents, or his surveyors, to investigate such details as the buyer desires validated. The Item described within this advert is offered subject to prior sale, price change, or withdrawal without notice.